Window cleaning is a very simple task. Or so we think! Moreover, the more you do it and the better the tools/supplies, the easier it becomes. We clean thousands of homes and commercial buildings just like yours. The concepts and processes are simple. One very basic rule of thumb: Anything applied to the windows, like glass cleaner, must be completely removed. Most homeowners don’t own a squeegee. For those people, we recommend a foam glass cleaner, in particular we recommend “E-Z Window Cleaner” by E-Z Windows Inc.
Avoid cleaning in direct sunlight when possible. Holding the can upright, point the valve opening 8-12” from the surface to be cleaned. Spray a fine mist and wipe clean. Use two dry absorbent cloth towels. One towel for initial cleaning, and the second for “buffing” out steaks and imperfections. 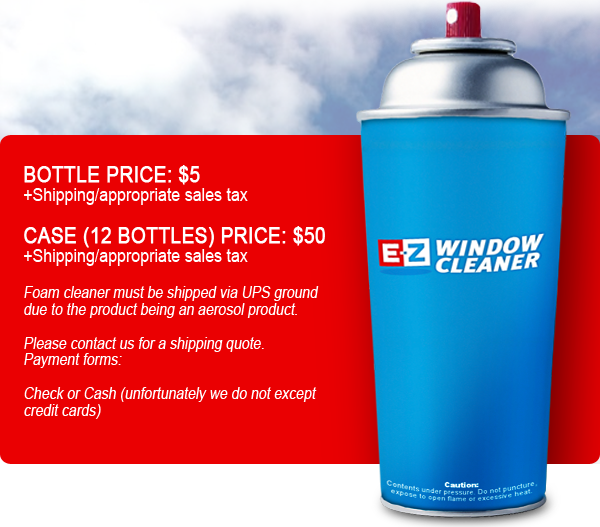 Contact us today to order E-Z Window Cleaner.